This tastefully renovated property consists of 5 bedrooms one of which is used as a library, living room, kitchen, 2 bathrooms, snug room, dining room, garage, utility room, storage room and summer kitchen. The property measures 345 sqm of construction and has lots of character and it’s on the market at a bargain price. Perfect for those who like privacy but close to amenities with their own private mature garden and woodland to enjoy. The Farmhouse is set over two floors with main living accommodation on the ground floor and has many original features and is situated close to Tomar in a small hamlet of Poço Redondo. The property is connected to mains water, electricity, has installed internet and phone line and has a septic tank for sewage. Hot water is provided by a gas boiler. The house is fully double glazed with external and internal shutters. The main entrance to the property is through the stylish living room with a unique wood burner and beautiful parquet flooring. Off the living room there is one of the bedrooms which also has a parquet flooring. From the living room there is a doorway, which leads into hallway. Hallway is decorated with traditional decorative wall tiles and also has parquet flooring. Off the hallway there is access to further two bedrooms. Both of them nicely decorated good sized bedrooms with parquet flooring. To the left from the hallway there is another bedroom, which current owners using as library, but it could be easily changed into another bedroom. The Library has views to the side of the property’s garden and once again this room comes with beautiful parquet flooring. At the end of the hallway there is a stylish family bathroom, which is fully tiled and has a toilet, large shower and vanity basin with storage cupboard beneath and mirror above. Sun terrace is situated at the back of the property, it is double aspect and very light. It is ideal to enjoy lovely evenings with a cup of tea (or glass of wine) and has views to the garden. Off the sun terrace there is another bathroom, which has been fully renovated and is very light. This bathroom is fully tiled and has a bidet, toilet and vanity basin with storage cupboard beneath and mirror above. Off the kitchen there is access to the the snug room, which has tiled floor and a wood burner. Off the snug room you can access a dining room. Dining room has tiled floor and partly tiled walls and has a Farmhouse feel to it. Next to the dining room there is a summer kitchen and another storage room ideal for the garden equipment. This part of the property has a separate entrance and ideal to use when working on the land or access to the garage. Next to dining room there is a short hallway where you can gain access to the garage. The garage is big, offering plenty of storage and also has an access gate for a vehicle. This is also where you will find the Adega. There is also a concrete stair case leading to the loft where you have more storage and also another bedroom, which could be ideal for the family or guests. This bedroom has original wooden ceiling and laminate flooring and has a lovely view to the side of the property. The property is fully fenced and private. There is 3 different vehicle access’s through iron gates and a pedestrian access which leads to the main entrance of the house. First vehicle access leads to the garage situated to the right adjacent to the house. Second gate is to the left of the property, which gives access along a concrete drive into the garden, which is ideal to use for tractor access. The third gate which is to the right of the property leads you onto a large concrete parking area, which has mature olive trees to create shade. Front garden has variety of flowering shrubs and has marble mosaic pavement. To the back of the property there is a concrete area which can be used as a siting or outside dining area and has a view and access to the garden. Property has very fertile soil and is ideal to grow vegetables. There are also 2 wells, which are fitted with a pump for irrigation and also to provide water to the property. The garden of the property is very private and has numerous established fruit trees such as apple, almond, orange, lemon, lime, olives, plum, cherry, peach, tangerine, pine, pomegranate and others as well as woodland. There is plenty of room to grow your own vegetables and install a swimming pool. 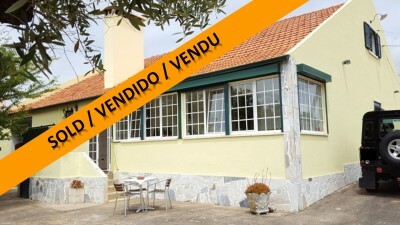 The property is situated in the small hamlet of Poço Redondo which has cafe bar, and the bus to Tomar. The larger town of Tomar, which is home to the UNESCO listed Convento do Cristo, is around 15 minutes drive from the property. Tomar is a bustling market town with a variety of supermarkets, shops, cafes, restaurants, bars, banks, health centres, hospitals, schools, bus and train station and university. The property is also only a short 10 minute drive from Castelo do Bode lake, which is popular for all kinds of water sport activities.